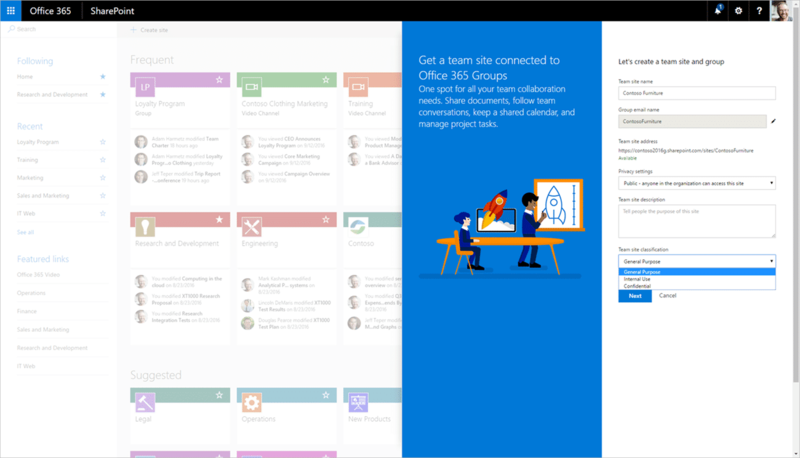 There are a ton of great new features launching into 2018 adding great new value to Office 365 subscribers, with updates that enhance how teams work together and unlock new ways to create and manage content across devices. Read on for details. New features for Microsoft Teams enable you to interact with apps in new ways, customize your personal workspace, and take quick actions. Command apps and take quick actions across Teams—Also introduced is the new command box in Microsoft Teams, a single point of entry that integrates your search and command experiences. Now you can quickly interact with apps, perform tasks, and navigate throughout Teams directly from the command box, in addition to searching across people, messages, files, and apps. 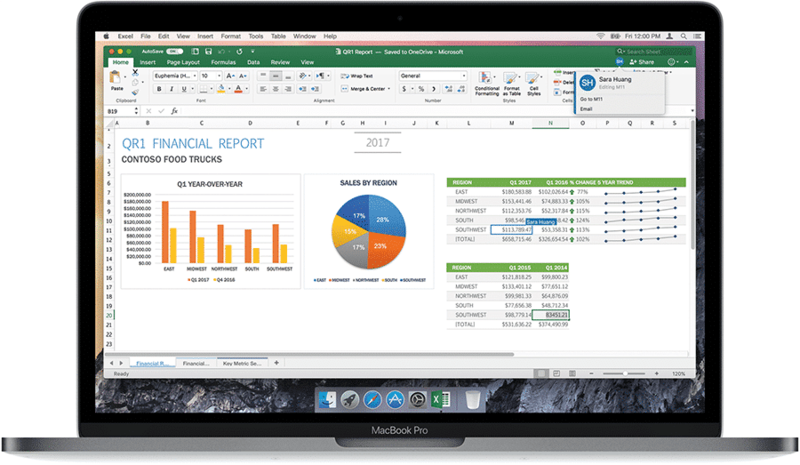 New Office 365 capabilities for iOS and Mac enhance how teams create content together, make it easier to produce advanced documents, presentations, and spreadsheets from anywhere, and introduce new ways to search, preview, and interact with files. Co-authoring for iOS and Mac—It is now easier for individuals to work together across devices with the general availability of co-authoring in Word, PowerPoint, and Excel for iOS and Mac. Now, whether you work on a Mac, PC, or mobile device, you’ll know who else is working with you in a document, see where they’re working, and view changes. Co-authoring is already available on the Office desktop applications for Windows, Office for Android, and Office Online. Automatically save your work on Mac—This month also marks the general availability of AutoSave in Word, Excel, and PowerPoint on Mac for Office 365 subscribers who store their documents in OneDrive and SharePoint. Whether you’re working alone or with others, your latest changes are now automatically stored in the cloud, so you never need to worry about hitting the Save button again. You can also view and restore content from earlier versions of the document at any time with support for version history. Drag and drop content and files on iOS—The Office and OneDrive iOS apps now support drag and drop for content and files. One of the most common and powerful tasks when creating content is integrating photos, graphs, and other objects from a variety of sources. Now Office 365 subscribers on iPad and iPhone can easily drag and drop content into documents, presentations, and spreadsheets from other Office apps or OneDrive. 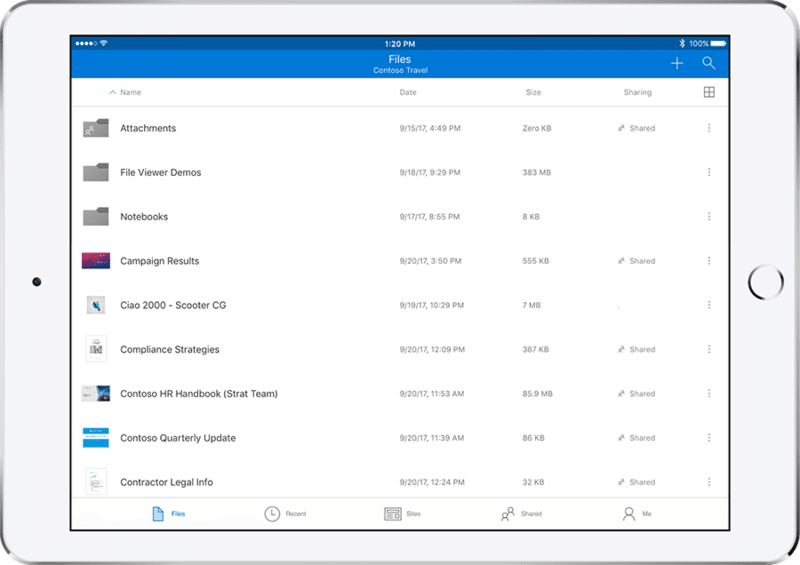 Support for drag and drop for iOS also enables you to move files to and from OneDrive and other sources—such as SharePoint or iMessage—making it easier to organize content scattered across different apps and services. Access OneDrive files from more iOS apps—OneDrive for iOS now natively supports the new iOS 11 Files app. This means iPhone and iPad users can upload, access, edit, and save content to OneDrive or SharePoint from any iOS app that supports File app integration—a top requested feature. Users can also tag their favorite OneDrive and SharePoint files from within the Files app, making it easier to find and use the content that matters to you. Preview more file types with OneDrive for iOS—Microsoft redesigned the OneDrive for iOS app with a more detailed list view, making it easier to scan file names, see relevant information, and sort files by specific attributes. The updated OneDrive for iOS app also creates crisp thumbnails and supports previews for over 130 file types, including Adobe Photoshop and 3D objects, so you can open, view, and share the right content without leaving the app. 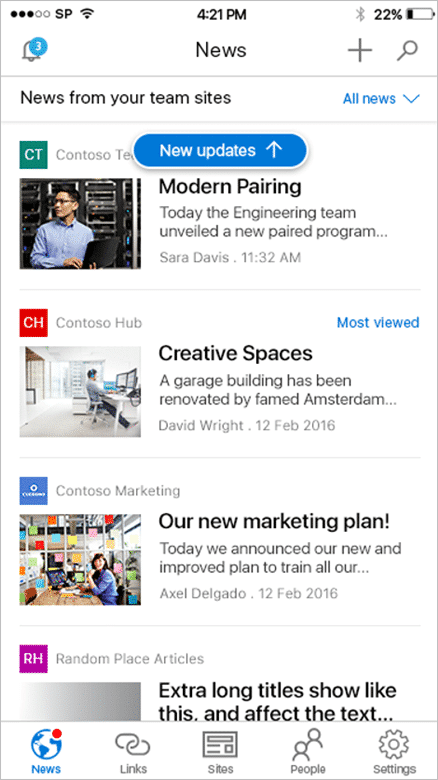 Search across your organization with Outlook for iOS—The new search experience in Outlook for iOS leverages the Microsoft Graph to surface results from your top contacts, upcoming travel itineraries, package deliveries, recent attachments, and more. Together with proactive search suggestions and a unified design, it now provides consistent, personalized results that enable you to discover information from across your organization faster. Improve reading skills with Learning Tools for Mac—Word for Mac now supports Immersive Reader and Read Aloud, tools previously available in Word for Windows and mobile apps. These tools enable content to be viewed in ways that are optimized for learning differences and allow documents to be read back with simultaneous highlighting. These features make it easier to recognize and correct errors as you write, improving reading and editing accuracy for everyone—especially users with learning disabilities such as dyslexia. 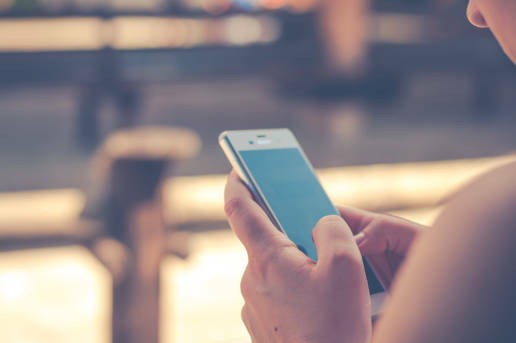 New ways to share on Yammer—Earlier this month, Microsoft introduced new ways for users to share engaging company-wide content from wherever they are with the Yammer mobile app. 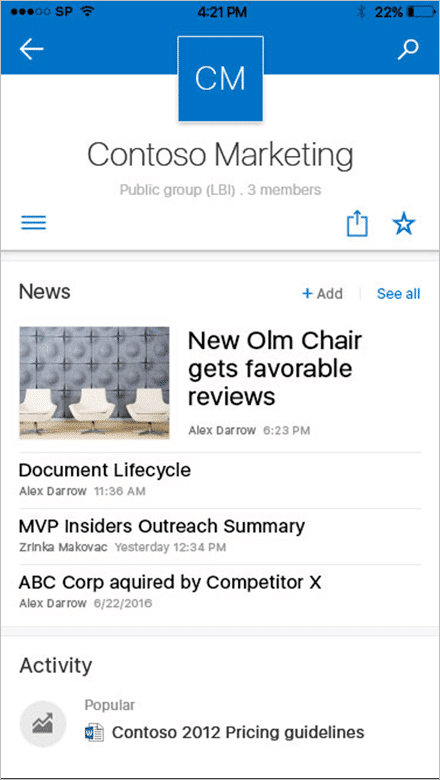 Users can now post announcements to groups, add animated GIFs, and more. 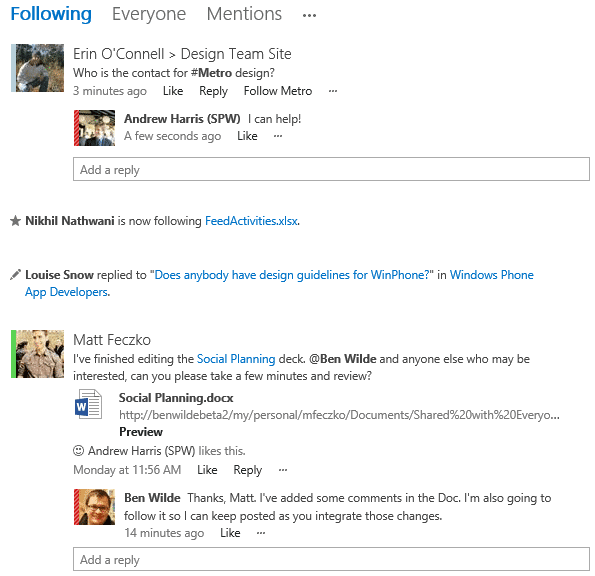 If you use the SharePoint app on iOS, you get the first look at the mobile experience of team news. 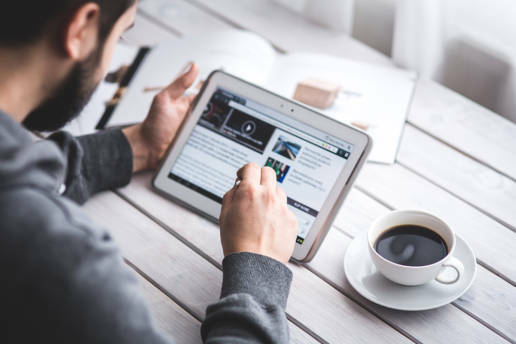 When you tap the Newstab, you will see a list of aggregated news using the intelligence of the Microsoft Graph from the sites you work in, the sites you follow and the sites your colleagues work in. 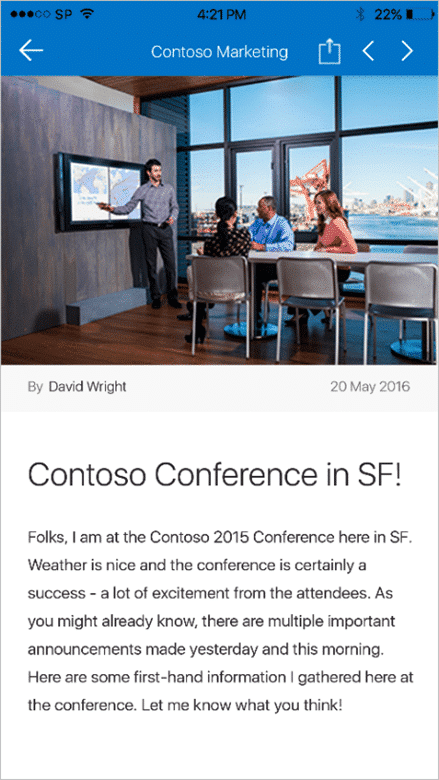 SharePoint mobile on iOS gives you one place to catch up on the news from across your intranet. That’s your news in your pocket! We’re pleased to announce that soon you’ll be able to create a site and a group for your team—right from SharePoint home in Office 365. 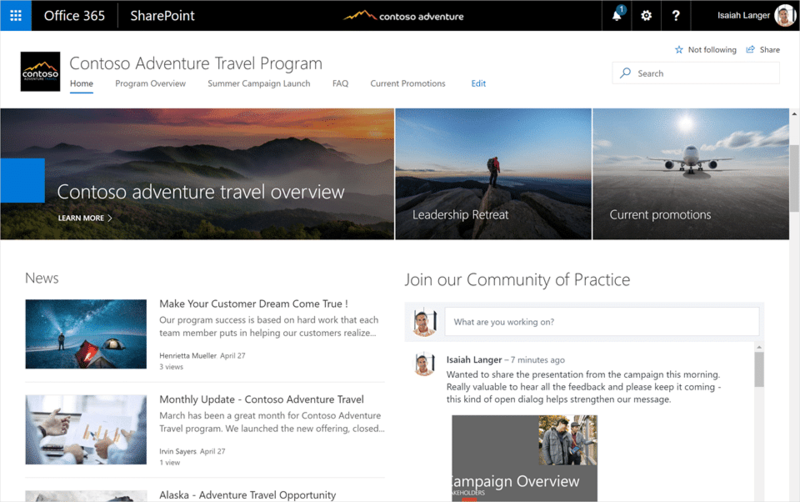 The Create site wizard will create an Office 365 group as well as a modern SharePoint team site. You will even be able add members and classify the site along the way. 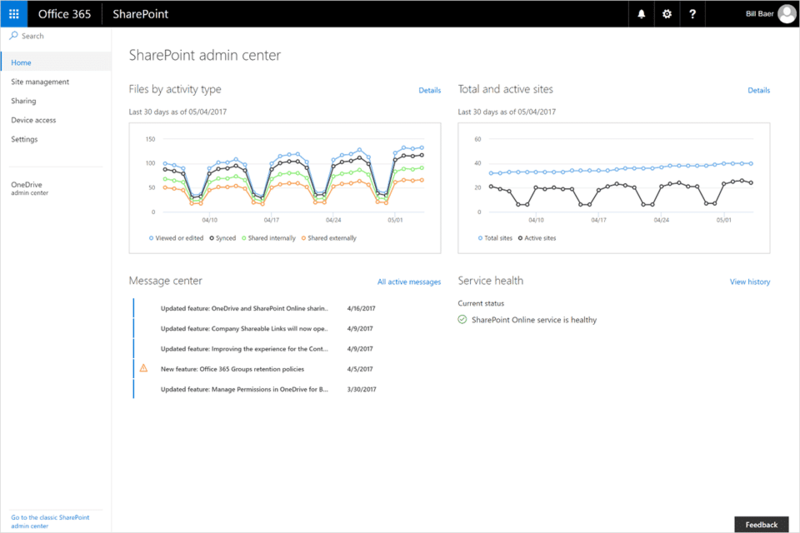 And if you’ve ever waited for a SharePoint site to be provisioned in the past, you’ll discover this process will create the site in mere seconds. 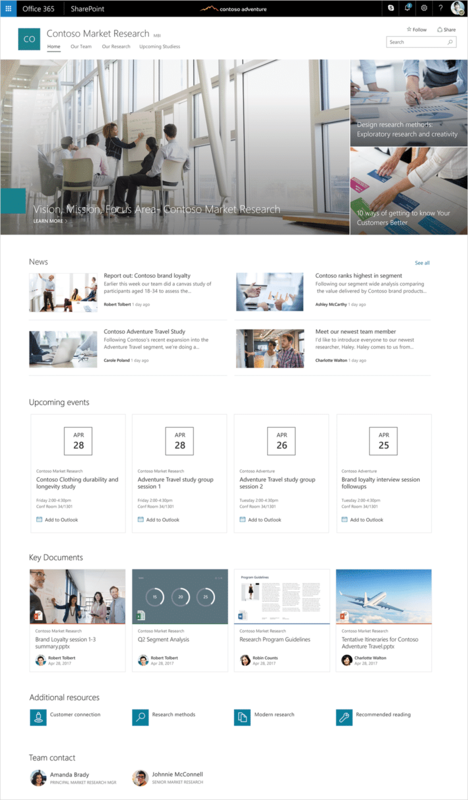 Create a team site right from SharePoint home. 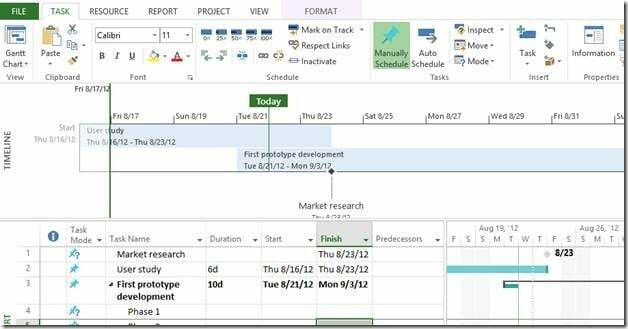 SharePoint tasks lists provide a great way to collaborate and stay up to date on the status of your projects. 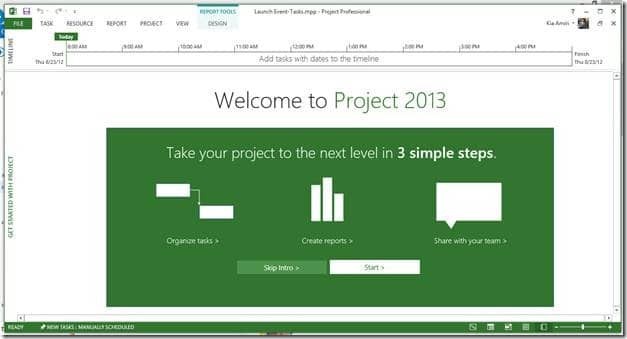 By using Microsoft Project Professional, you can take your project management to the next level by using more advanced features like scheduling and even create gorgeous and comprehensive reports. 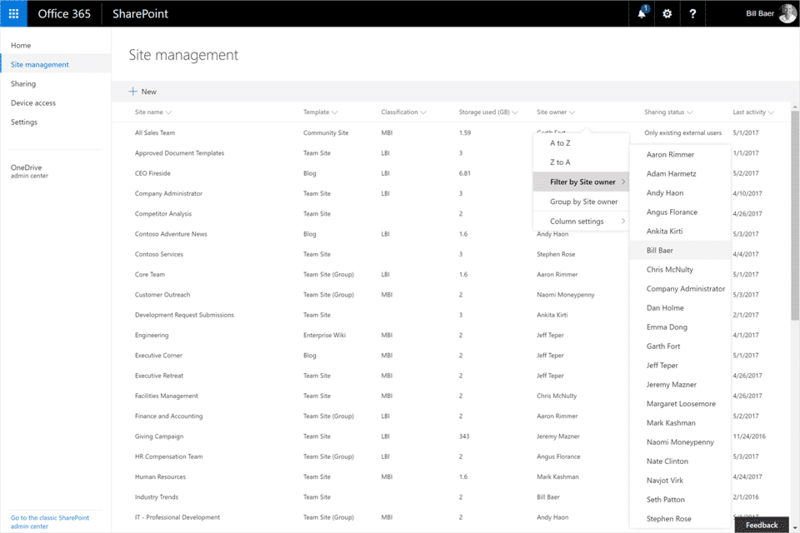 In a way, the SharePoint site and its tasks lists are where team members can view and edit the progress of their tasks, and Project Professional is where project managers can manage the progress of their projects. 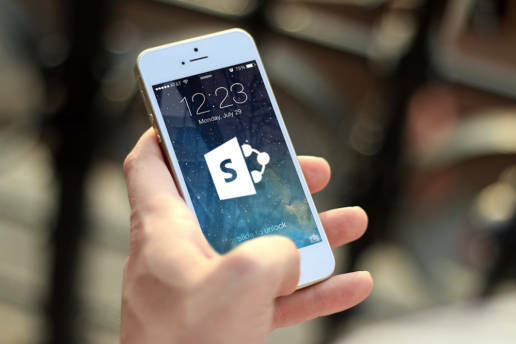 SharePoint tasks list sync empowers you to use the great functionalities of both Project and SharePoint tasks lists, at the same time. 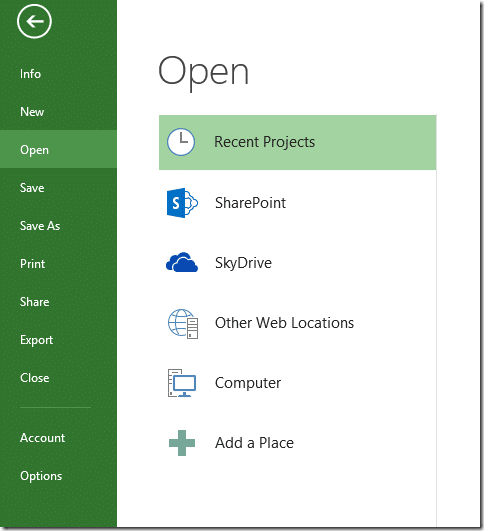 You can continue editing the project plan in Project, and when you hit Save, Project will automatically sync the plan with the SharePoint tasks list, and also save the project file (.mpp) in the Site Assets library of the SharePoint site. 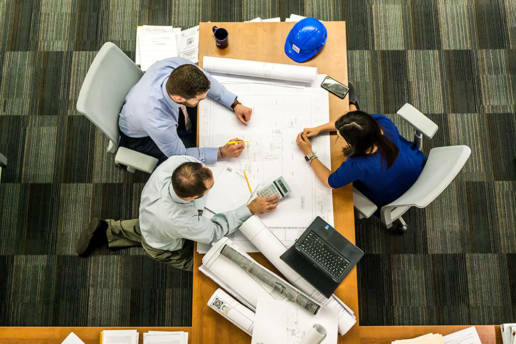 Therefore, every time you, or any other project manager, open the project plan, you can view the most recent status of the project. By saving an up to date project file in the Site Assets library it makes sure that users won’t have to deal with multiple conflicting or out-of-date project files. This will create a new Project Site and save the project plan in the Site Assets library of that site. From that point on, you can open this this project plan from the tasks list and keep the tasks list and the project plan in sync. During the SharePoint tasks list sync, the following fields between your SharePoint list and Project by default: task name, start date, finish (due) date, % Complete, resource name, and predecessors. 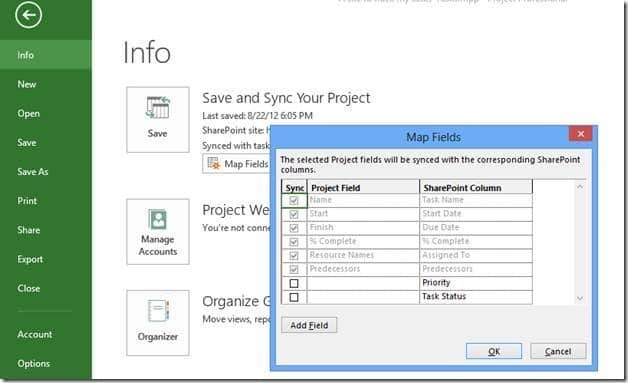 However, if you want to map more fields to be synced between Project and SharePoint, you can do so in the Info tab of the File menu: open the “Map Fields” dialog, and pick any new fields that you’d like to sync. This way, you can have your team members report on other custom fields, or generate reports based on non-default SharePoint columns. This is a great feature for all you project managers, try it out and let us know what you think! 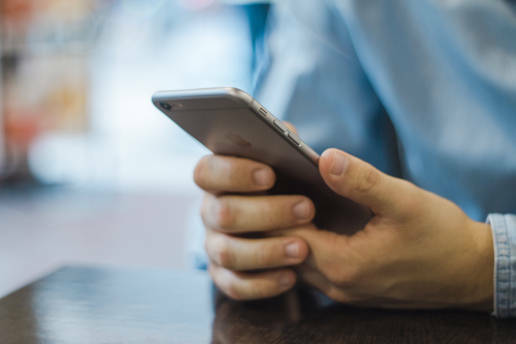 Intelligent communications go beyond traditional unified communications, enabling you to complete tasks more efficiently with minimal context switching, participate in more productive meetings that cover the entire meeting lifecycle, and better manage your everyday communications overload. 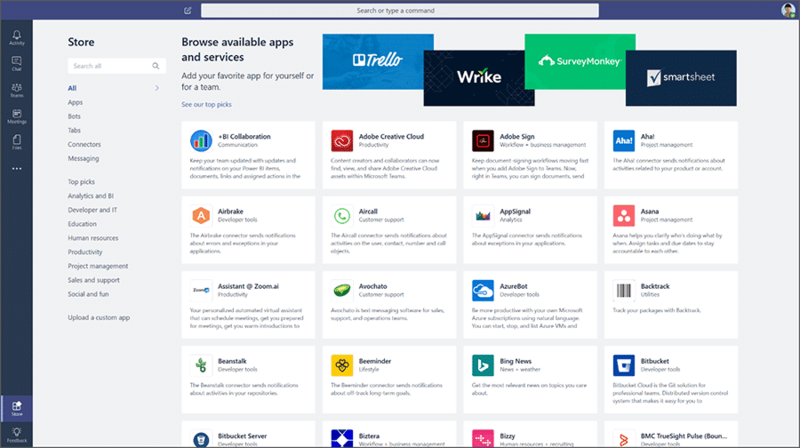 Microsoft Teams is core to Microsoft's vision for intelligent communications—bringing together conversations, meetings, files, Office apps, and third-party integrations—to provide a single hub for teamwork in Office 365. Teams is now being used by over 125,000 organizations across the world in just six months since its launch. Its strong momentum has proven that teamwork is essential to the way work gets done today. To achieve this vision for intelligent communications, Microsoft is bringing comprehensive calling and meetings capabilities into Teams, along with data and insights from the Microsoft Graph, and a strong roadmap of innovation to empower teams to achieve more. As these capabilities are built out, Teams will evolve as the primary client for intelligent communications in Office 365, replacing the current Skype for Business client over time. 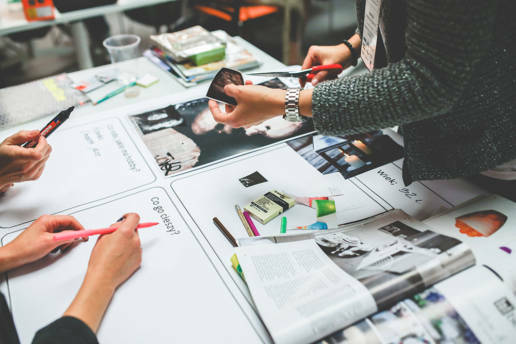 Before a meeting, Teams will surface relevant documents and rich information about the participants to help you prepare. 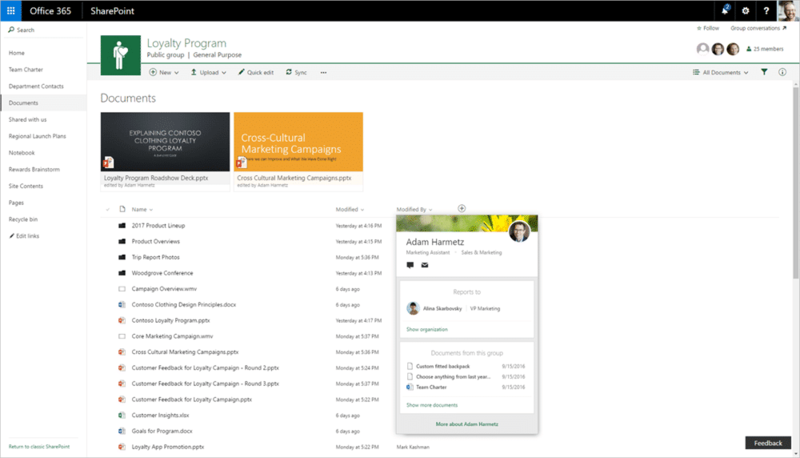 Over the past six months, Microsoft has enhanced the communication capabilities in Teams, with new features like scheduled meetings, Outlook calendar integration, and meetings on mobile. Also, earlier this month, they began rolling out guest access—so you can use Teams to collaborate with people outside your company. 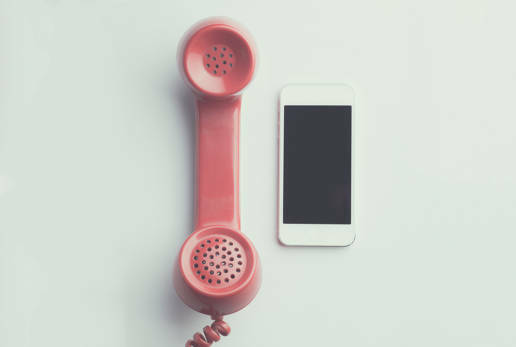 In the coming months, they'll begin adding calling features in Teams—including inbound and outbound calls to PSTN numbers, hold, call transfer, and voicemail. Coming soon will be enhancements to Teams meetings, including audio conferencing (available in preview today)—enabling participants to join a Teams meeting by dialing a telephone number—and interoperability between Teams and Skype for Business, including universal presence, and messaging and calling interoperability. This is just the beginning of a big wave of feature releases that will bring the core set of meetings and phone system capabilities into Teams. Since Microsoft Teams became generally available about six months ago, more than 125,000 organizations have discovered how teamwork comes to life in Teams. Teams again is getting even better with the rollout of guest access to all Office 365 commercial and education customers. 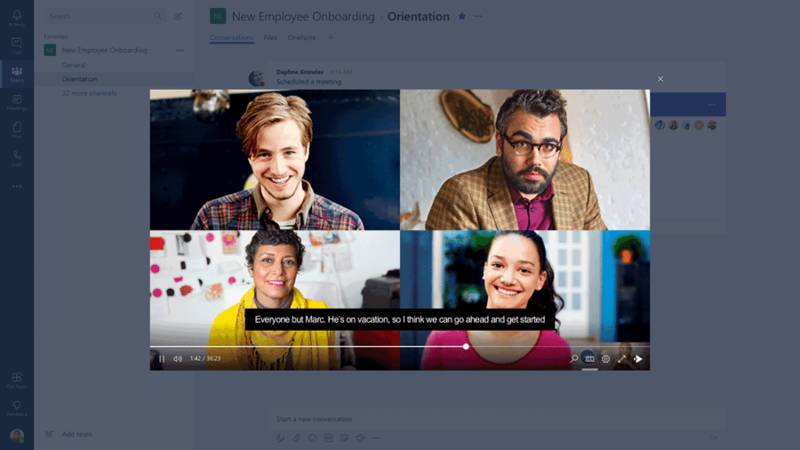 Now Office 365 users can add people from outside their company to a team, so guests can participate in chats, join meetings, collaborate on documents, and more. 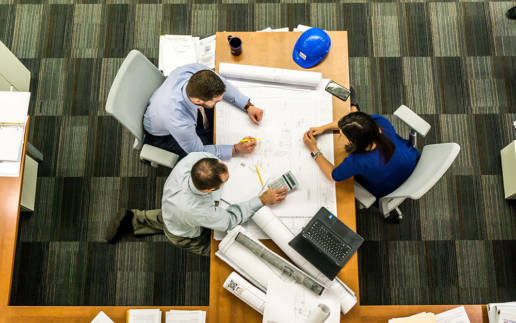 Teamwork—Teams come in all shapes and sizes, and you need to be able to easily communicate and share with others you want to work with, including people outside your organization. Anyone with an Azure Active Directory (Azure AD) account can be added as a guest in Teams. That means anyone with one of the more than 870 million user accounts—across Microsoft commercial cloud services and third-party Azure AD integrated apps—can be added as a guest in Teams. Later, the ability for anyone with a Microsoft Account (MSA) to be added as a guest in Teams. 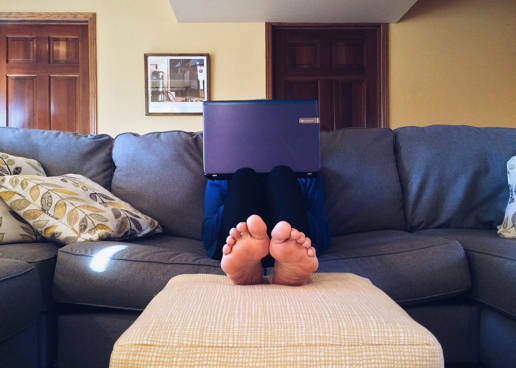 If the guest doesn’t have an existing MSA, they will be directed to create a free account using their current corporate or consumer email address, such as Outlook.com or Gmail.com. Security and compliance—Security is a big concern here and Microsoft customers made this known. Guest access in Teams will provide enterprise-grade security and compliance assurances. In Teams, guest accounts are added and securely managed within Azure AD through Azure AD B2B Collaboration. This enables enterprise-grade security, like conditional access policies for guest user access. Azure AD also uses adaptive machine learning algorithms and heuristics to detect anomalies and suspicious incidents, enabling mitigation or remediation actions, such as multi-factor authentication, to be triggered as appropriate. In addition, with Azure AD, IT departments have unparalleled insight into the activities of external users in their organization through detailed sign-in and access reports. Guest user content and activities are under the same compliance and auditing protection as the rest of Office 365.